The term ‘mast’ was probably first used to describe a food source for domestic livestock. 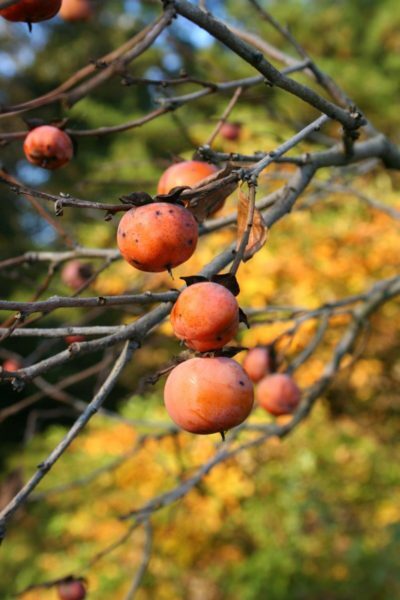 Webster defines mast as “the fruit of oak or beech or other forest trees used as food for hogs and other animals.” When foresters and wildlife biologists use the term, they are referring to the woody plant (trees, shrubs or vines) fruit used by wildlife for food. All tree and shrub species produce some type of fruit. The type of fruit varies greatly, but for many forest wildlife species, mast is an important source of food. In fact, the diets of squirrels and many other wildlife species consist almost entirely of mast throughout the year. Mast is often categorized as either soft or hard. Hard mast consists of hard shelled seeds that have a relatively long “shelf life” and are typically high in fat, carbohydrates and protein. These characteristics make them a food source that is both high in energy content and available well into the winter months. For many Ohio wildlife species, hard mast is a key food source for survival during the winter months when other sources of nutrition are most limiting. Examples of hard mast include acorns, hazelnuts, hickory nuts, beechnuts and walnuts. 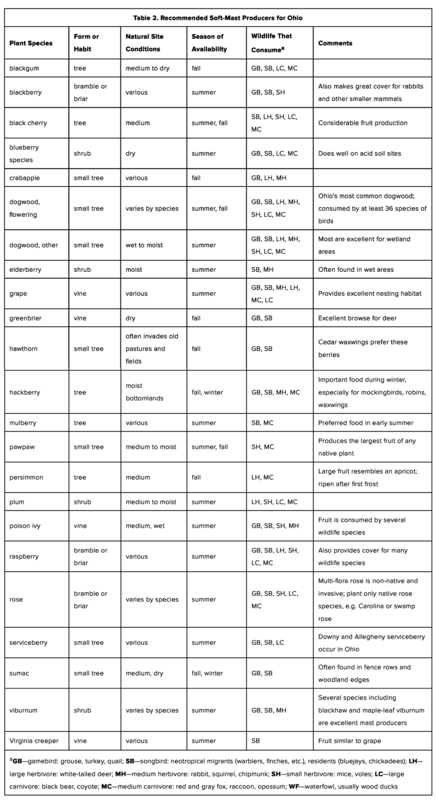 Table 1 provides a list of numerous Ohio hard-mast producers and wildlife that consume them. Figure 2. Persimmon, a soft-mast producer. Figure 1. 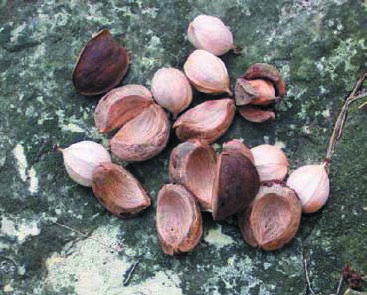 Shagbark hickory nuts—A common hard mast found in Ohio forests. Soft mast is fleshy, perishable fruit that is often high in sugar, vitamins and carbohydrates. It is usually not available in great quantities in winter months. During drought years, soft mast may be a crucial source of moisture for some wildlife and their young. Soft mast may also be a crucial energy source for some wildlife species during migration. Examples of soft mast include black cherries, persimmons, pawpaws and blackberries. See Table 2 for a more comprehensive listing of soft-mast producers in Ohio. All species of trees, shrubs and vines produce some type of fruit, and most of these are consumed by wildlife. However, many of these tree species do not produce consistently abundant mast crops. For instance, some oaks only produce good seed crops at intervals of five or more years, while other species such as maple are more frequent mast producers. While the winged “helicopter” fruits found on maples are probably not the favorite food of any wildlife species, they are eaten by a variety of wildlife when other mast is not available. Additionally, some fruit is very perishable or readily consumed by wildlife. These fruits may only be available for a very short period of time. Serviceberry fruit, for example, is so highly preferred by songbirds that it is often gone within days of ripening. Diversity of mast can also affect wildlife in your woodlot in other ways. For example, small mammal predation of songbird nests increases in years of bad acorn crops when there is little else to eat. Variety helps to ensure that food is available from season to season and from year to year. Acorns from trees in the red oak group (red, black, scarlet and pin oak) are more bitter than those in the white oak group (white, bur, chinkapin and chestnut oaks). As a result, acorns from the white oak group are preferred by most wildlife species over those in the red oak group, and they are often quickly consumed in the fall months. 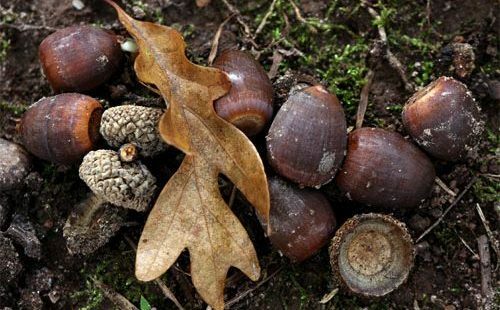 Red oak acorns have a much longer “shelf life,” which makes them available for consumption during late winter when other food sources are scarce. They also provide food in years when few white oak acorns are produced. Encouraging a wide variety of tree, shrub, and woody vine species is one of the best ways to make sure there is always food available for wildlife on your property. The most obvious way to increase the variety of trees, shrubs and vines on your property is to plant them. Planting is often a long-term proposition for many tree species (oaks may take more than 25 years to produce), but shrubs can produce mast within a few years. Since many plants are difficult to establish under shaded conditions, planting is usually most effective in open areas or on the edges of existing forestland. Ohio’s wildlife species are well adapted to utilizing mast from native plants as a food source, and there are hundreds of native trees, shrubs and vines from which to choose. 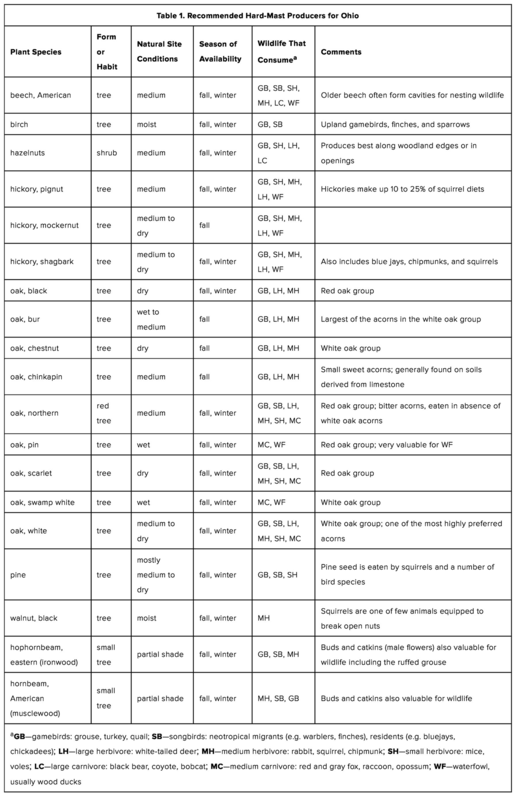 Each native plant species is well adapted to a limited range of soil and climatic conditions, but there are a variety of species to select from for nearly any site condition found in Ohio. It is important to understand the conditions found on your site and to select a species that is well adapted to that site. Take the oaks for example—pin oak and swamp white oak thrive in soils that remain saturated for much of the growing season, while other oaks such as black oak and chestnut oak do quite well under very dry conditions. Non-native plants have evolved under different growing conditions and some are not successful in Ohio. On the other hand, there are numerous examples of non-native plants, such as multi-flora rose and Japanese honeysuckle, which have become overly aggressive and have displaced many of Ohio’s native mast producers. Planting non-native species can actually have a long-term effect of reducing the diversity of mast-producing plants on your property. Native tree and shrub seedlings are available through the Ohio Department of Natural Resources (ODNR) Division of Forestry’s nursery and numerous private nurseries in the region. Shrubs (mostly soft-mast producers) and brambles can be maintained by cutting or mowing at approximately five-year intervals along woodlot borders. Many of these species are prolific sprouters and will regenerate rapidly following mowing or cutting. Another way that you can enhance mast production in your forest is by providing additional space for existing mast-producing trees that are being crowded by neighboring trees. This is an excellent way to increase soft and hard mast production in a relatively short period of time. Trees that are overly crowded grow slowly and often do not produce an abundance of flowers or fruit. Removing neighboring trees allows mast producers to expand their crowns, which provides more energy and a larger surface for mast production. 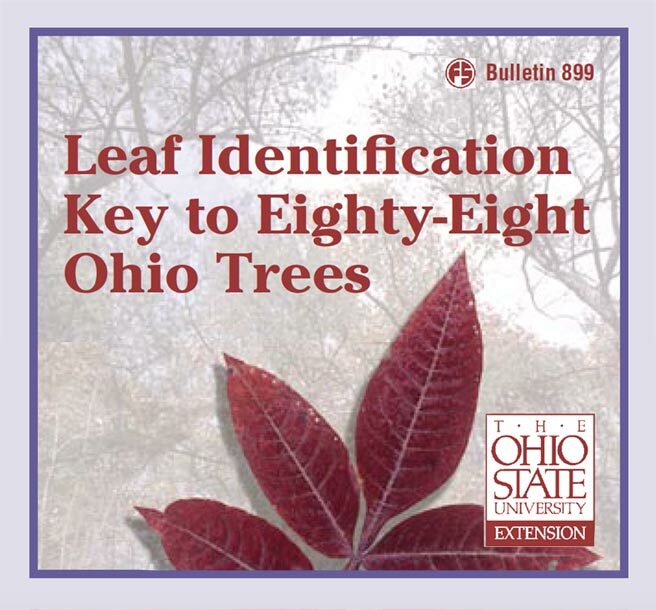 See OSU Extension fact sheet F-50, Crop Tree Management: A Tool to Help You Achieve Your Woodland Goals for information on how to increase the production potential of mast producers in your woods. Inventory your woods to determine the number and diversity of mast producers. This will help you to set realistic wildlife management goals for your property. After setting goals you can then work with a forester or biologist to determine which types of mast producers can be enhanced to help you accomplish your goals. Strive to maintain as many hard-mast producers as practical. The ultimate goal would be to maintain 20 or more hard-mast producing trees (greater than 14 inches) per acre of woodland with a balance of about two trees in the red oak group for every one in the white oak group. When oaks and other hard-mast producing trees are limited, encourage diversity among soft-mast producers. Maintain approximately two to three fruit-producing grape vines per acre on trees that are otherwise of little value for mast or timber production. Grapevines are often damaging to forest trees. They can rob trees of needed light, and make them more susceptible to damage from ice. However, they also provide excellent soft mast and cover for many species of wildlife. Mow or cut approximately one-fifth of shrubby areas along woodland edges each year. This results in a range of ages of shrubby mast producers to help ensure consistent production of soft mast from year to year. Plant a variety of native mast-producing shrubs and trees in areas where natural regeneration of these species is not likely to occur. Maintenance of newly planted seedlings by mowing and/or herbicide applications is usually needed to ensure acceptable levels of survival in the first few years after planting. In areas with high deer populations it also may be necessary to use tree shelters or other forms of protection while establishing plantings. Control non-native invasive plants, such as, autumn olive, multi-flora rose, tree-of-heaven, and Japanese honeysuckle, when they threaten to out-compete native mast producers. Total elimination of non-native plants is often not attainable, but it is often possible to maintain a sustainable balance. Consult with your ODNR Service Forester, ODNR Private Lands Biologist, or your Ohio State University Agriculture and Natural Resources Extension Educator for specific recommendations for your property. These natural resources professionals have experience and access to information that will help you to enhance the production of mast for wildlife on your property.